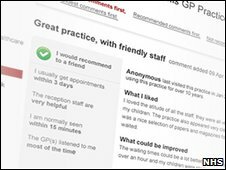 Patients are being encouraged to rate their GP surgeries on a new NHS website designed to drive up standards in primary care. At www.nhs.uk, patients will be able to post comments ranging from how they were treated to whether it was easy to book an appointment. But writing abusive comments and mentioning staff by name will not be allowed, say health officials. The website will compare the 8,269 GP practices in England only. The health minister Mike O'Brien said the website was part of plans to modernise the health service. He said: "As we open up real choice in primary care, it is vital we equip patients with enough information to make the right choice for them. "This new tool allows every single GP practice in the country to see the patient's view on what they are doing well and what needs to be improved. "It will help drive up quality across the board, and is another step in ensuring we have a modern NHS which reflects the needs of the patient," he added. There are 23 million visits to GP practices and related services every month. The Family Doctor Association supports the website initiative. Its chairman Dr Peter Swinyard said: "Patient feedback on GP services is an effective way of driving up the standards of primary care even further." In September, ministers announced they wanted to abolish GP boundaries, allowing patients to register with a practice of their choice. A similar site to compare the performance of hospitals is already up and running.